Today is the day of the Winter Solstice in the Uk and in my notional Old English calendar it is the 1st of Afteryule, which begins the year of 1575 in that calendar. This year is a leap year as there are 366 days between Winter Solstices in UTC time reckoning. This is marked by the addition of an extra day to the second month (Solmonath), making it 30 days long instead of he usual 29. 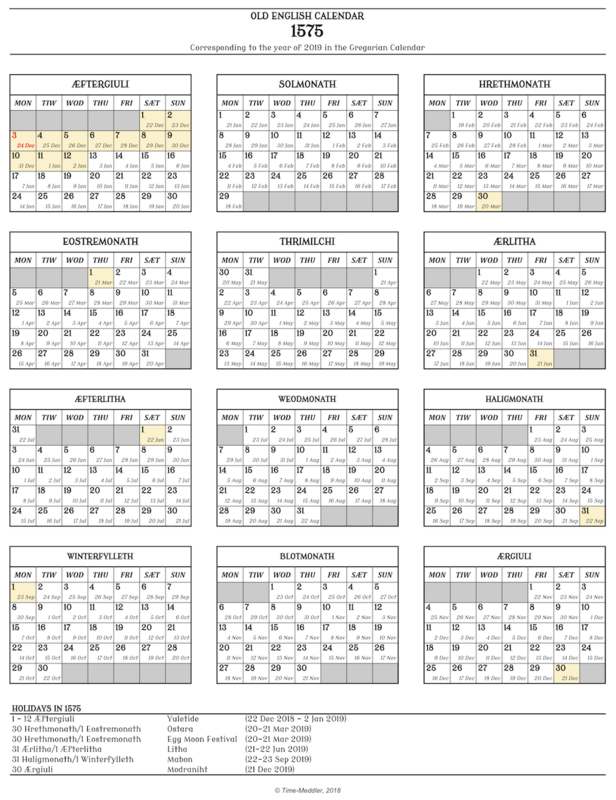 The calendar for the year 1575 in the Old English calendar can be downloaded at the following link: Old English Calendar 1575. So, we’re nearly there. Tomorrow night will be the occasion of this year’s Oidhche Shamhna, and at midnight the calendar count will tick over from 164.19.12.29 to 165.1.1.1. Here is the calendar for the first month of the new year, Samhain. Slàinte Mhath. We still have a few days to go before the new Celtic year (and lunar cycle), and I will post nearer the time with the calendar for the new month. More details on Celtic holidays will be posted as and when ideas come to mind. Also, although the above mentioned blog does not seem to be being updated any more, it’s a very interesting read with some interesting concepts relating to Celtic traditions and how these may be preserved and practised.